When you think of a meerkat, what image comes to mind? Chances are, you’re imagining one or more meerkats, standing on their hind legs, spines straight, necks elongated, scanning the surrounding environment for possible danger. This posture is known as the ‘raised guarding position’, and several meerkats within a mob will be designated to take turns as sentinel while the others are foraging. A series of barks from the sentinel will send the mob scurrying into the burrows for cover. Sentinel behaviour has evolved as a crucial survival strategy in many species, including humans. Whether we are acting as a sentinel for others, or we are alone and looking out for our own safety, part of growing towards independence is learning to become aware of our surroundings, and assess them for potential danger. At the first whiff of a threat, our brain triggers a flood of hormones which make us hyper-alert and ready for an immediate reaction to the situation. Heightened alertness may be perceived as an endearing and even humorous quality in meerkats, but in humans ‘hypervigilance’ can become an entrenched and very uncomfortable way of being. There is nothing endearing or humorous about it. Your body may be on constant alert, taught and tense, eyes darting here and there, scanning for threats, unable to relax, even when no real danger is present. 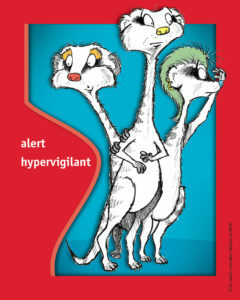 Hypervigilance is an enhanced state of sensory alertness that can increase anxiety and cause exhaustion. It can also interfere with basic functions like sleep and digestion—seriously impacting our physical and mental health. People can be especially susceptible to hypervigilance if they have experienced trauma. The ‘red alert button’ somehow gets stuck in the ‘on’ position, triggering a sustained stress response. It is not surprising that hypervigilance is one of the central features of post-traumatic stress disorder (PTSD). But hypervigilance can also be more prevalent within certain roles and professions. For example, it can become habitual for some people who oversee others’ safety for extended periods of time, such as parents, teachers, carers, life-guards or emergency workers. While our so called ‘panic hormones’ are part of our self-defence mechanism and are therefore to be celebrated, a few skills to ‘unpanic’ ourselves and decompress are also crucial to have in our bag of tricks. 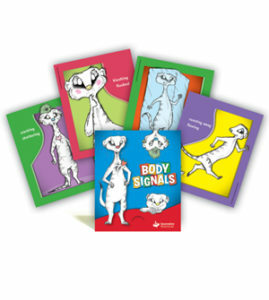 Our set of Body Signals® may be of assistance.